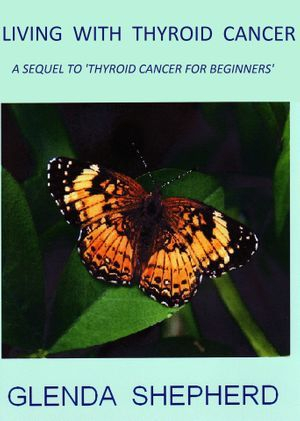 REVIEWS OF 'LIVING WITH THYROID CANCER'. This book was really informative re thyroid cancer. I have this condition and presently going for my 2nd RAI treatment. The first time prior to my two ops and again before treatment, it gives me informed facts plus the unselfish sharing of herself...experiences, feelings, thoughts etc, and allows valuable identification of the thyroid journey. Many thanks. It was enjoyable to read about the experience of another person with thyroid cancer. I had some difficulty following all the locations/vacations/costs as the author is not from the USA. It was nice to see others have additional side effects too which are not discussed by physicians prior to or during treatment. I was very disappointed with the shipping of the book as I expected quicker shipping and the ability to track the shipment. This book was really informative re thyroid cancer. I have this condition and presently going for my 2nd rai treatment. I read the book that Glenda wrote for beginners too. This is the 2nd time that I have picked this book up. The 1st time prior to my two ops, and again before treatment. It gives me informed facts plus the unselfish sharing of herself....experiences feelings thoughts etc, and allows valuable identification of the thyroid journey. Many thanks.